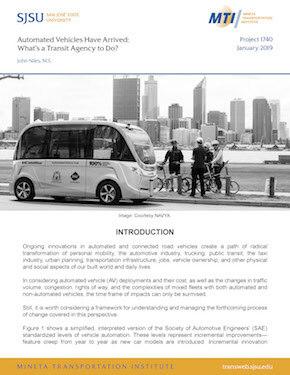 Automated Vehicles Have Arrived: What's a Transit Agency to Do? Still, it is worth considering a framework for understanding and managing the forthcoming process of change covered in this perspective. John Niles researches, designs, plans, and evaluates transportation improvement policies and actions as an independent consultant. He is a Research Associate with the Mineta Transportation Institute at San Jose State University, leading teams that prepared reports on new planning processes for transit-oriented development, bus rapid transit incrementalism, and park-and-ride advantages for transit ridership. Lately he has been focused on priorities for automated vehicle deployment and new incentives for higher vehicle occupancy in peak periods to reduce congestion.